Four members of a militant white supremacist group from California have been arrested on charges they traveled to Virginia last year to incite a riot and attack counterprotesters at a white nationalist rally that turned deadly, federal authorities said Tuesday. 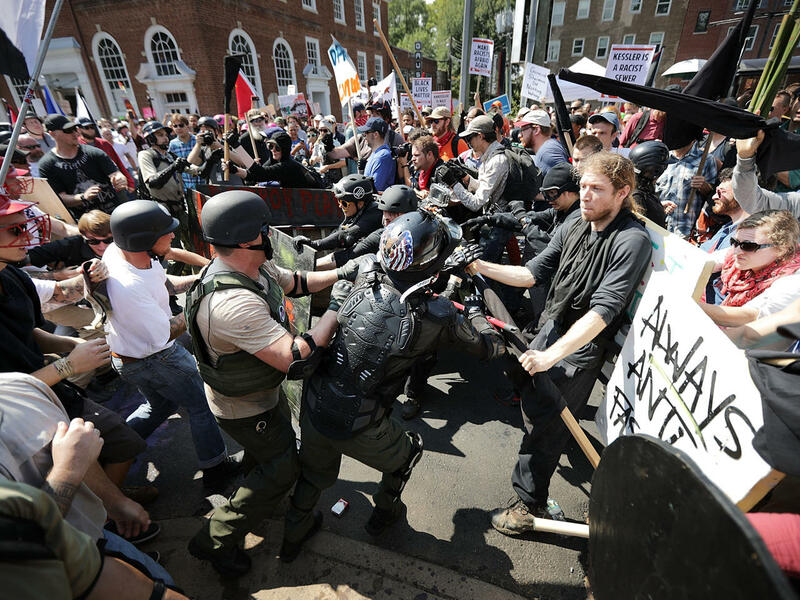 The affidavit alleges the four men were "among the most violent individuals present in Charlottesville" in August of last year during a torch-lit march on the University of Virginia campus and a larger rally in downtown the following day. It says photos and video footage shows they attacked counterprotesters, "which in some cases resulted in serious injuries." The men have also taken part in "acts of violence" at political rallies in Huntington Beach and Berkeley, California, and other places, the affidavit alleges. "This is a group that essentially subscribes to an anti-Semitic, racist ideology, and then organizes, trains, and deploys to various political rallies, not only to espouse this particular ideology but also to engage in acts of violence against folks who are taking a contrary point of view," U.S. Attorney Thomas Cullen said at a news conference in Charlottesville held to announce the charges. Miselis' attorney, Angel Navarro, argued fervently for his release, detailing how his client got his master's at UCLA and worked as an engineer at Northrop Grumman for five years before being dismissed after his connection to Charlottesville became public. "I never thought I would ever in my life quote President Trump but I'm going to quote President Trump. When he said there are good people on both sides, like everybody else, I was shocked. I couldn't believe it," Navarro said. "But ... I know that my client is in many ways a normal person who's lived a normal life until very recently." Prosecutor David Ryan argued against bail for Miselis, saying agents found smoke bombs, flares, and thousands of rounds of ammunition, mostly for assault weapons, in his home, where he had a wall hanging that said "88," a common abbreviation for "Heil Hitler." Magistrate Judge Jean Rosenbluth said she was impressed with Miselis' academic and professional credentials and that "clearly he's an intelligent young man" who until recently had "lived a law-abiding and apparently productive life." "What I'm concerned about is who he is now and the danger he presents to the community," Rosenbluth said. Cullen said each defendant faces a maximum of 10 years in prison if convicted on the two counts they each face: traveling to incite riots and conspiracy to riot. However, defendants often get less than the maximum under federal sentencing guidelines. Cullen said the suspects don't face hate crime charges or civil rights violations, but didn't rule out the possibility of bringing more charges in the future. The arrests come more than a year after hundreds of white nationalists descended on Charlottesville in part to protest the planned removal of a statue of Confederate General Robert E. Lee. Clashes first erupted on Aug. 11, 2017, as a crowd of white nationalists marching through the University of Virginia campus carrying torches and chanting racist slogans encountered a small group of counterprotesters. The following day, more violence broke out between counterprotesters and attendees of the "Unite the Right" rally, which was believed to be the largest gathering of white nationalists in at least a decade. Street fighting exploded before the event could begin as scheduled and went on for nearly an hour in view of police until authorities forced the crowd to disperse. The four men, he said, made their way to the rally with their hands taped, "ready to do street battle." Cullen said the four men had "extensive and robust" social media profiles and used social media to further their purposes. He called that a "significant aspect of the case." Segal said the group has roots in the racist skinhead movement in southern California. Daley, of Redondo Beach, figures "prominently" in the organization, according to the affidavit. About two hours after authorities forced the rally to disband, a woman was killed when a car prosecutors say was driven by a man fascinated by Adolf Hitler plowed into a crowd of peaceful counterprotesters. The death toll rose to three when a state police helicopter that had been monitoring the event crashed, killing two troopers. President Trump sparked a public outcry after he blamed both sides for the violence.